McBride signed a reserve-future contract with the Redskins on Wednesday, JP Finlay of NBC Sports Washington reports. Analysis: McBride had a strong preseason with the Jets but fell victim to the numbers game. He'll have the chance to earn his stay with Washington should he produce during training camp and beyond. McBride was waived by the Jets on Saturday, Rich Cimini of ESPN.com reports. Analysis: McBridge signed a reserve/future contract with the Jets in January and was featured in a few of their preseason games, but he was ultimately unable to distinguish himself in a relatively young group of New York wideouts fighting for a roster spot. McBride caught both of his targets for 24 yards Thursday in a 15-13 loss to the Redskins during Week 2 of the preseason. McBride caught both of his targets for 16 yards during Friday's 17-0 win over Atlanta in the preseason opener. Analysis: McBride is hoping to work his way up from the practice squad this season, but nothing about his performance here suggests he's poised to do so. McBride (undisclosed) is fully participating in training camp, Brian Costello of the New York Post reports. Analysis: McBride finished the 2017 season on the Jets' practice squad/injured list, but he seems to be back to full strength during training camp. The fourth-year receiver is looking to make it as a depth option in New York. The Jets signed McBride (undisclosed) to a reserve/future contract Monday, Rich Cimini of ESPN reports. Analysis: McBride snagged eight of 15 targets for 144 yards across eight games for the Bears this season but was let go in late November. 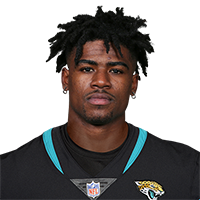 Shortly thereafter he joined the Jets' practice squad, where he finished out the year on the practice squad injury list due to an undisclosed issue. While it isn't clear if he's returned to full health at this juncture, McBride has plenty of time to recover before workouts start up in April. The Jets placed McBride (undisclosed) on their practice squad injured list Friday, Brian Costello of the New York Post reports. Analysis: It's uncertain what prompted the move, but the fact that McBride is dealing with an injury likely ends any chance he had of reaching the Jets' 53-man roster over the final four games of 2017. 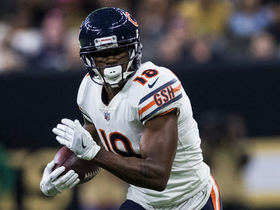 The wideout had previously appeared in eight contests with the Bears this season before being cut loose, amassing eight receptions for 144 yards in those contests. 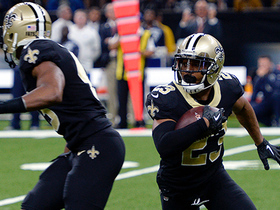 McBride was signed to the Jets' practice squad Friday. 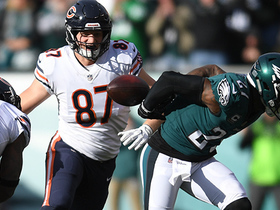 Analysis: McBride was waived by the Bears at the end of November after totaling eight receptions for 144 yards on 15 targets this season. The Jets' receiving corps has little impact beyond top two receivers Robby Anderson and Jermain Kearse, so McBride could end up as a depth option if he is able to crack the 53-man roster. McBride was waived by the Bears on Tuesday. 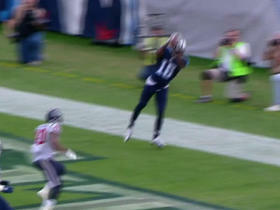 McBride caught two passes for 20 yards in Sunday's 31-3 loss to the Eagles. 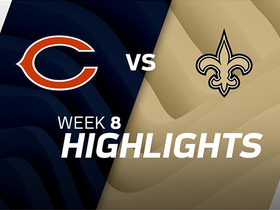 Analysis: McBride was second on the Bears with six targets, but he had very little production to show for it. Aside from his 92-yard performance in Week 8, he's posted a total of 52 yards in his other six games combined, providing fantasy owners with minimal upside. McBride caught both of his targets for 14 yards in a Week 11's 27-24 loss to the Lions. 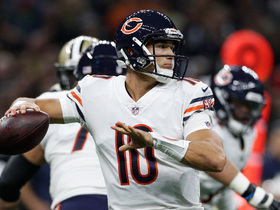 Analysis: With Mitchell Trubisky completing just four passes to his wide receivers, McBride was the second-most productive player at his position on the afternoon, but he was a minor part of the game plan. Aside from his unexpected 92-yard effort in Week 8, he's posted just 32 yards in the other five games he's played and isn't targeted enough to be a reliable fantasy option. Philadelphia Eagles safety Corey Graham intercepts Chicago Bears quarterback Mitchell Trubisky. 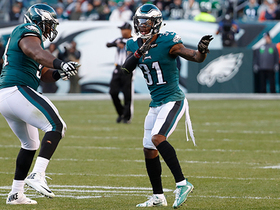 The Eagles defense get their second chance at "The Electric Slide". 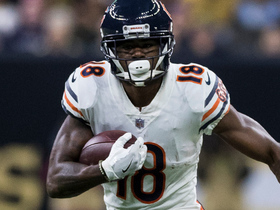 Chicago Bears wide receiver Tre McBride gains 25 yards on a short pass from quarterback Mitchell Trubisky. Chicago Bears quarterback Mitchell Trubisky hits wide receiver Tre McBride for a gain of 22 yards. Chicago Bears quarterback Mitch Trubisky floats a perfect pass to wide receiver Tre McBride for 45 yards. 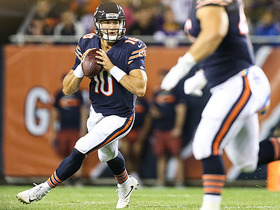 Chicago Bears QB Mitchell Trubisky hits wide receiver Tre McBride for 18 yards. 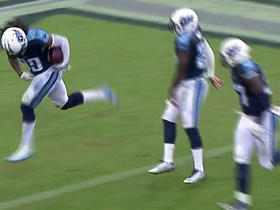 Titans Zach Mettenberger hits Tre McBride for a 1-yard touchdown.